“Scintillating…addictive” applauded The Guardian; “outstanding…one of the best I’ve ever seen,” acclaimed The Telegraph; “mesmerising” said The Spectator. All were describing the exhibition Sargent: Portraits of Artists and Friends at London’s National Portrait Gallery earlier this year. But for anyone in New York this summer, it gets even better. An expanded version of the show of John Singer Sargent’s portraits of the influential and colorful characters from the worlds of art, literature, music, and theater who were his friends—Claude Monet, Auguste Rodin, Robert Louis Stevenson, Henry James, and Ellen Terry, to name a few—is on view at the Metropolitan Museum of Art until October 4. We asked Elizabeth Kornhauser, Alice Pratt Brown Curator of American Paintings and Sculpture, and Stephanie Herdrich, assistant research curator, who organized the installation here, to tell us about some of their favorite works that will be seen only in New York. 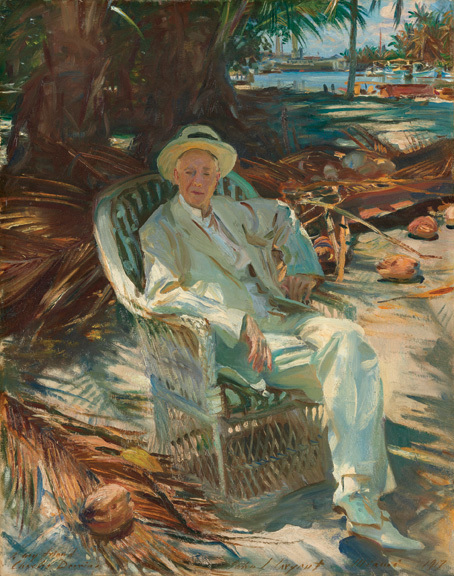 “The exhibition is arranged chronologically by the locales where Sargent painted,” Kornhauser says, “so it seemed logical to expand the American section for our audience.” One coup is the portrait of the artist’s patron and close friend Isabella Stewart Gardner, which rarely leaves its Boston home. Other important additions are a pastel of artist Paul César Helleu, a lifelong friend from Sargent’s student days in Paris, and a portrait of Charles Deering, whom Sargent met on his first trip to the United States in 1876. An art collector, Deering owned Sargent’s ravishing portrait of Mrs. Hugh Hammersley, one of three works in the Met’s own collection that are also augmenting the exhibition here. The others are William Merritt Chase and Madame X (Madame Pierre Gautreau), the latter to be hung in intriguing dialogue with Dr. Pozzi at Home, the sensuous likeness of the famous Parisian gynecologist with whom she, and many others, are said to have been romantically entwined. Above: Portrait of Charles Deering by John Singer Sargent (1856–1925), 1917. Inscribed “To my friend/Charles Deering John S. Sargent Miami 1917” along bottom. Oil on canvas, 28 ½ by 21 inches. Private collection.